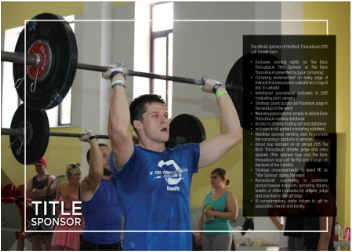 Do you want to sponsor or be a vendor at The Rock Throwdown? Our objective this year is to go above and beyond to maximise exposure of companies sponsoring our event on social media pre-event, during the 2-day competition, and post event in order to thank you and assist you in generating profits and gain brand awareness with our athletes, followers and spectators. If you or your company are interested in sponsoring our event, please fill in the Sponsors form on the right hand side and someone from our team will get back to you to further discuss your sponsorship proposal. We need your support to make this happen. Thank you sponsors!